Our bikes. Loaded for summer touring, so minus the front racks and panniers. They’re the 2012 model which we’ve kept almost entirely with the standard components. 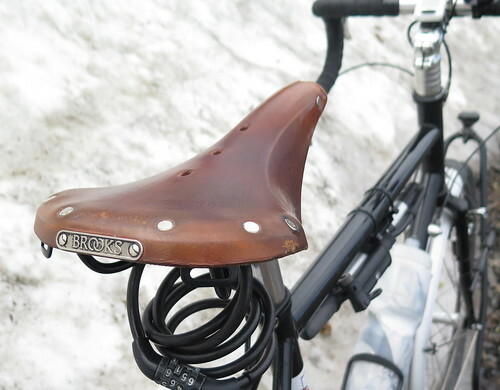 We upgraded to the classic Brooks B17 saddle which our backsides both seem to get on with far better than any other saddles we’ve used in the past. We will give them an overhaul just before we leave with new tyres (Schwalbe, of course), brakepads, chain etc so that we’re not setting off with anything that’ll wear out too soon. We’ve set them up with the Surly ‘Nice Rack’ rear rack, mainly for the name, and also the Tubus Tara front rack. We also fitted SKS Trekking mudguards. For panniers, we went for the tried and tested Ortlieb Roller Classics front and rear, plus the Rear Rackpack and Ultimate 6 Handlebar bag. Not a particularly imaginative touring rig but in my experience, cycle tourists are serious about their gear, so if something is popular, it is probably popular for a reason. So far, for us, everything has lived up to expectations. The MSR vs Hilleberg tent debate was eventually won by MSR in the shape of the 3 man Mutha Hubba HP. The size of a 3 man tent with increased vestibule and interior room is well worth the extra grams in our opinion. The MSR can also be pitched on hard ground without the need for pegs which gave it the edge over the Hilleberg options. The ‘HP’ is the slightly upgraded model, which is lighter weight and also warmer. 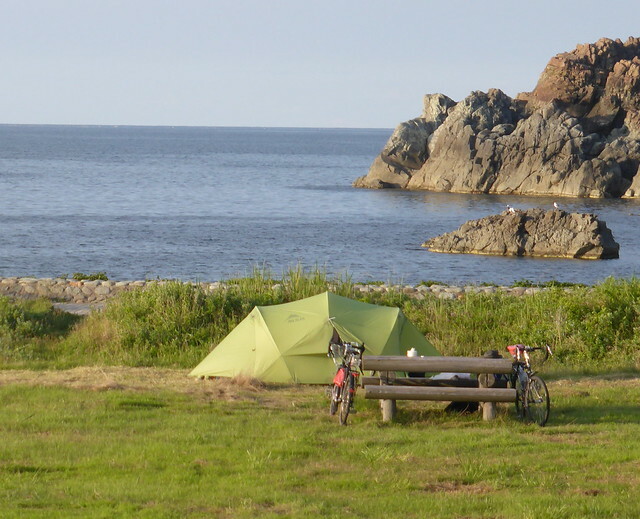 Recent edit – For the first section of the trip in Japan, we’ll be trialling a Mont-bell Stellaridge 2 tent. It was kindly supplied to us by Mont-bell so we’re keen to use it. It’s a two man tent so slightly smaller than we are used to, but in Japan we won’t have any security concerns with leaving our panniers outside. It’s super lightweight and we want to see if the weight savings are worth the sacrifice of space. We’ve sent our MSR tent ahead, so will revert to using that if we decide we need more room. Andy has the Cumulus Mysterious Traveller 650 sleeping bag. Rated down to -12. Clare has the slightly warmer Cumulus Mysterious Traveller 750 which is good down to -16. The zips are on opposite sides so can be zipped together, and we’ll also be using Macpac silk bag liners. We both have Thermarest Prolite sleeping mats plus the additional chair conversion kit which turns them into comfortable seats with a backrest. Although we’ve planned our route to avoid the coldest weather, we will still have some very chilly nights in Central Asia and Eastern Europe. 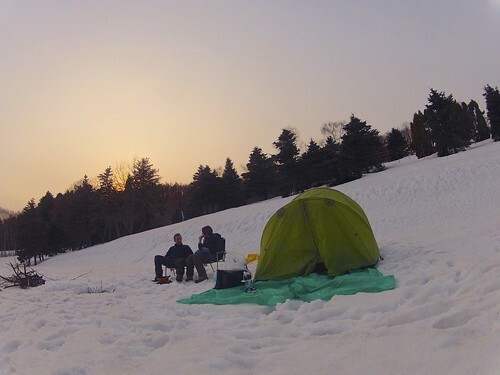 We have used our gear camping in the snow here in Hokkaido, so it’s good to know that it’ll stand up to low temperatures if necessary. Again, we went with MSR for our kitchen. The Whisperlite International stove can use a range of different fuels and is light and reliable. We have an MSR cookset comprising a couple of pans, plates and mugs which is more than adequate for us. Other cutlery and bits and pieces has just been pieced together from various outdoor shops and 100 Yen shops. We’ll also be bringing with us tools and spares for when things invariably go wrong or break on the road. We’ll have a small notepad computer, a Canon camera each, a Kindle or two and will try to pick up an unlocked smartphone so we can use local SIM cards where possible to have a means of communication on the road. Fortunately we have had most of this gear for a couple of years now so we are confident that it does the job, and we are familiar with it. Packing everything for this length of tour will be a challenge, but we can be quite ruthless when it comes to packing light. Some big climbs in the Japan Alps in the first stages of the trip will no doubt help us prioritise what is necessary and what extra weight can be left behind! Solar for the gadgets? Or just charge if/when you get electricity? Looks great. So envious of your journey (but you already know that!). At the moment we don’t have solar or any dynamo power. We’re hoping not to be too reliant on gadgets so we’ll rely on finding outlets where we can. 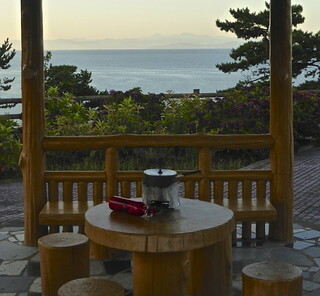 Easy in Japan, not so much elsewhere maybe. I do like a bit of social media though, so may well look into solar options…. What about for navigation? Paper maps? Brave man! I guess if you’re only charging a phone or other small USB devices, you’d only need a small 5-10W panel. I guess you can always buy AA batteries to charge USB if you get desperate. How many kilos are you each carrying? Well done for keeping the blog up to date, we have a big backlog to work through. Hi Mark, hows it going mate? We’ve probably got between 20-25kg each, although haven’t properly weighed everything. Obviously that varies depending on how much food/water we’re carrying. Here in SE Asia we’ve not got any food with us as restaurants are everywhere and cheap! Hope you guys are both doing well. Hopefully see you in Europe next year! Helllo. 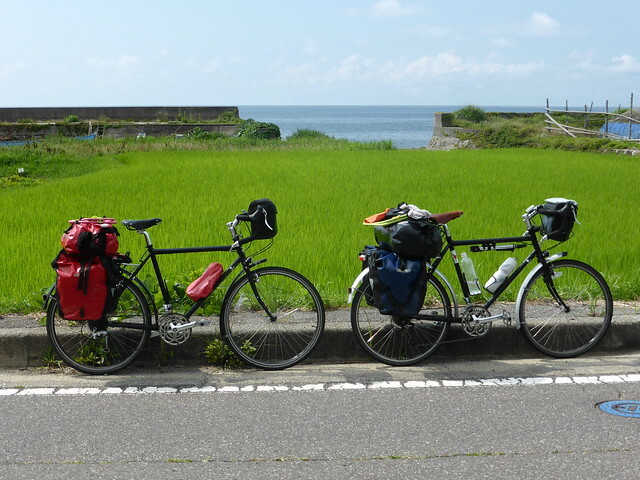 I found your blog as I’m currently researching for my own cycling trip from Tokyo to Manchester. Your blog has been a fantastic source of information for me so far, and the more I read the more I can’t wait to start – I plan to leave Japan In March next year. I have a load of questions for you! Where did you source most of your equipment from? I’ve never done anything like this before so I’m starting from scratch, so any pointers on where to get equipment will be a great help. How are you guys finding camping? Is it fairly straight forward? How did you choose your route? I’m planning on going from Japan to Korea then, China, Mongolia, Russia and then in to Europe. Anyway I do have loads more questions but I’ll leave them for now. Keep up the blog and good luck guys! Hi Adam! Thanks for your comment. Glad our blog has been helpful. We got almost all our gear online from overseas. At the time we were buying stuff about 4/5 years ago, the yen was very strong, so it made buying things from the UK/US good value, even with a bit of import tax added on. Camping has generally been very easy. Especially in Japan and Korea. China we only really camped in the far West. It was busy in the East, and hotels were everywhere and very cheap, so we mostly used them. Thank you very much for your reply and I’ll will be in touch as I continue to plan my trip. Keep up the blog mate, it’s great to see that this is possible! Wish you good luck and a safe journey back home. I’m an Argentinean actually cycling in Thailand and being reading your stories for more inspiration. By the way : what kind of cannon cameras are using ? Any special lens ?? Just a gossip question. Love your pics. Enjoy . Hi Santiago! Thanks for your comment. We have 2 cameras. One is a G16, with a filter adapter, to which I’ve added a polarising and a UV filter. It also gives a bit of protection to the lens. The other is a smaller SX600. We’re happy with them both. They take good photos, but are compact, and cheap enough that we don’t worry too much about having them on tour and bouncing around in our handlebar bags. 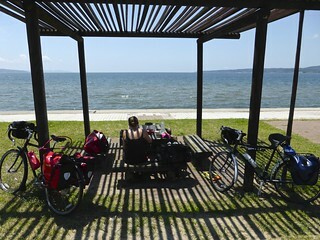 I hope you’re enjoying Thailand, we had such a good time cycling there. We’d definitely like to get down to South America some day and see Argentina! Good luck and enjoy the ride!